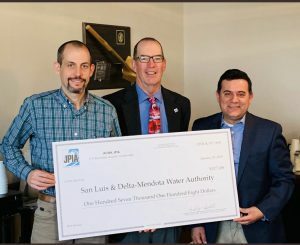 Since 1992, the San Luis & Delta- Mendota Water Authority has been an organization dedicated to maximizing value for our employees, the landowners, and the water users of the Authority. This hard work has yielded consistent, long-term success. On April 4, because of your commitment and dedication to safety, the SLDMWA Board was presented with a refund check for a portion of the workers’ compensation liability insurance premiums we fund on your behalf. I wanted to take this moment to thank each one of you for your commitment and dedication to the Authority’s safety program. You are our first line of defense against an unsafe workplace or unsafe workplace practices, and this recognition by our insurance company shows how well you are executing. I’d also like to take a moment to specifically recognize Jim Lenhardt for his commitment to our training and to making sure each one of us goes home safely to our families. You are all valued members of the Authority family and your continued contributions are vital for us to continue to be successful in meeting our mission, vision and values. All of our organizational achievements are made possible because of your individual efforts as well as the efforts of your team members. Again, thank you for your hard work, dedication and excellence in service.